Yussef al Manialawi, was born to peasants of the Manyal al-Rawda island (now at the center of Cairo). He was trained from an early age in the dhikr of Laytiyya’s brotherhood. One of his trainors was Shaykh Khalil Mehrem, the head of Cairo’s cantors. Like other members of the brotherhood, Shaykh Yussef partly shifted from religious singing to the developing school of urban secular court-patronized art music. He became a singer to private circles and gained a mythical dimension amongst his people. 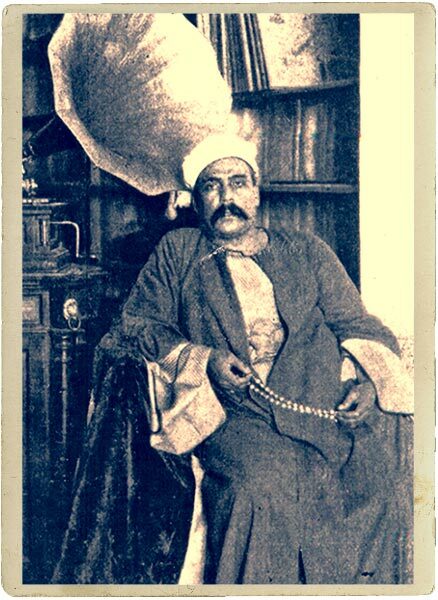 As an elitist and demanding artist, Manyalawi was bound to make a major contribution to the musical Renaissance of the late 19th century through his stature and the magic of his voice. Khedive TawfIq sent him with Hamuli to Istambul in 1877, so that they might refine their inspiration in contact with Ottoman court music, and display the musical achievements in vassal Egypt to Sultan Abdulhamid. 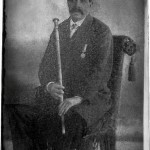 Thanks to his friend and protector al-Suyûfî Pasha, Manialawi obtained a monopoly in the tin trade of Cairo, an honorable trade that allowed the munshid to consider singing as a source to obtain additional gains. It is probably only after the arrival of record companies that Manialawi could benefit more from his singing than from his commercial activities. Yussef al Manialawi was lucky enough to witness the birth of the phonograph. 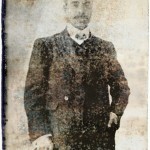 A pioneer of commercial recordings of Arab music, he first recorded some 30 discs around 1905. Of poor quality, these were made for Orosdi stores by the German Beka company, and issued under the label Sama° al¬Muliik (The Concert of Kings). The British Gramophone Company then paid him the fabulous amount of 6000 pounds and a bonus of 10 piastres on each record sold, to fill over 60 double-sided discs between 1906 and 1911. The pieces recorded are vocal elements of the wasla. Shaykh Yasuf is accompanied by zither/qânûn player Muhammad al-°Aqqad (1849¬1930), violonist Ibrahim Sahlun (1858¬1920) or Sami al-Shawwa (1889-1965), flute/nay player °Ali Salih, and occasionnaly a lute/Oud and a framed drum/ riqq (also called daff). In terms of number of recordings made, Yussef al Manialawi ranks first place in the gramophone catalog in 1930. A unique monument of an exquisite tradition, his voice is one of the few traces that we have of the artistic flowering in the Middle East at the turn of the century. Even though he was not a dawr composer, his performances leave much room for creative variations and improvisations of his own genius in such a way that he made of the adwar he interpreted his own masterpieces. Hence his reputation of being one of the masters of the Khedivial School. As a playful artist, Yussef al Manialawi took delight in developing the liveliest and most lilting aspects of adwar. Serene and bashful, he executed melodies with precision, leaving no room for redundancy. He preferred expressing his emotions in the classical poems by raising his voice at discreet and subtle points.